Do the winter blues have you longing to spend some time in your garden? It might not feel like it right now, but spring will be here before we know it! In the meantime, this is a great time to think about making some improvements to your property so you can be ready to make the most of the warm weather when it finally arrives. Today we’ll look at a few outdoor structures you can add to your property in preparation for spring. Our Amish-built sheds offer an affordable, convenient way to gain additional storage for garden tools, outdoor furniture and more. You can even design a customized vinyl or Dura-Temp shed right from our website. Just choose the style, dimensions, color and trim options you want, and we’ll build a shed that matches your exact specifications. For a more rustic appearance, you can choose from one of our board and batten sheds instead! 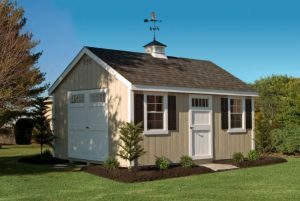 These sheds are available in several different sizes, styles and colors, and they are sided with 1’ x 10’ white pine boards to prevent shrinking and expansion from moisture and temperature fluctuations. Interested in doing more entertaining this year? You can create a serene outdoor setting for you and your guests to relax in with an Amish-built gazebo or pavilion! These simple structures can transform the look and feel of your yard, creating an attractive focal point that enhances the appearance of your existing landscape design. Best of all, they can be built in a variety of styles and sizes to suit your unique needs. 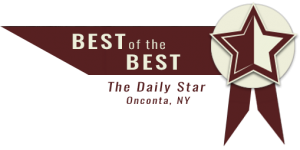 As always, we also offer free delivery anywhere within 100 miles of our location in Oneonta, New York. To learn more about these or any of the other structures you can find at Amish Barn Company, feel free to give us a call or contact us online today!